Imex put out a great set with these 1/72 Pilgrims. 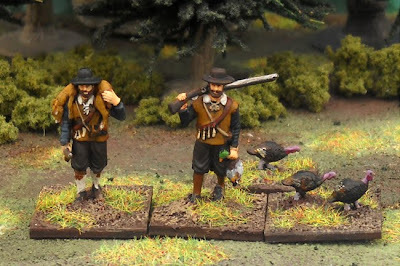 Most of the models are townsfolk in daily activities, but they included 4 musket poses that can be used as 17th century Puritan Massachusetts militia. (See all the models from this set on PlasticSoldierReview.com) The above three are attired well enough for King Philip's War. The fellow holding the duck (see photo bellow) can be added to the troops by simply cutting away the bird. The hunting poses, although expertly done, are historically inaccurate. It was a surprise for me to learn that the Pilgrims were not hunters. The first generation of colonists arriving in the 1620s & 1630s had no hunting tradition back in England. In fact, it was illegal for them to hunt as wild game were considered the property of the crown. In the colony hunting could be also viewed as a sinful activity. Idleness was actually a prosecutable offense, resulting in a fine. Sitting around in the woods for hours to shoot a deer or ducks was considered an inexcusable waste of time. If a Puritan colonist had a taste for deer he would hire a local Indian to go hunt for him. See The Skulking Way of War to read more on Puritans and hunting, and A Rabble in Arms to read more on the Puritans' strict laws. Now that I've painted these single-based poses I have it in mind to create a pilgrims diorama or a Massachusetts militia army for playing De Bellis Antiquitatis. The DBA rulebook doesn't go up to black powder / musket days, but an unofficial supplement exists: DBA Extension 1500-1900AD. Tim at Tim's Miniature Wargaming Blog brought this to my attention. Again, there is no 16th century English colonial militia army listed, so I'd have to formulate my own. There was another unofficial supplement that does include English colonist and North Eastern woodland Indian armies called DBA-RRR, but the website seems to be gone. 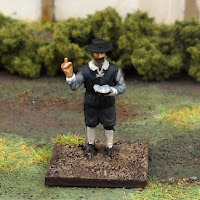 Imex will cover the militia men, maybe with some English Civil War models from A Call To Arms. I'll also need some cavalry troopers. On the advice of Alanus at Dux Homunculorum I bought a box of Revell 30 Years War Swedish Cavalry. 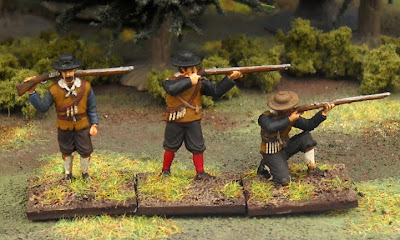 A couple of these Revel models look similar to the trooper illustrated in Osprey Publishing's Colonial American Troops 1610–1774 (2). Google Books used to include a preview of the illustrations pages, but now it looks like I should find myself a copy of this out of stock book. Update: Unfortunately Mega Miniatures ceased production and sold off its molds. I don't know who (if anyone) sells these animals now. 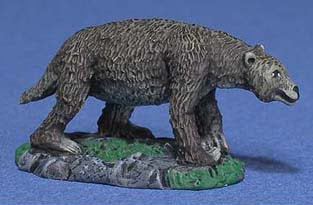 Mega Miniatures will soon be releasing three new animals to join your 25/28mm prehistoric models. Miniature painter Roger O'Dell paints Mega Miniature's new releases for their catalog. Once they have the photos he sells them, which is how I saw these three pics. It will probably be a month or two before they are available for purchase—I can't wait! The saber tooth cat looks great. I quite like its gaping mouth / swiping-paw pose. 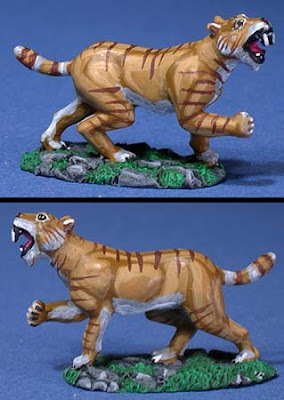 I'm wondering how it will compare to the saber tooth cats sold by Pulp Figures. Next up is a giant ground sloth. I'm wondering just how giant this sloth model will be. The image file name was labeled as megalonychidae, so that should mean this sloth will be a bit smaller than my painted Marx megatherium. Check out the Wikipedia article about prehistoric ground sloths. 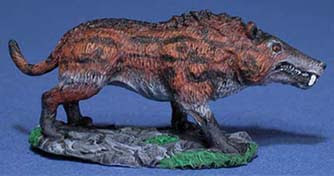 Lastly, we have an Andrewsarchus. These snarling beasts pre-dated man by millions of years, but that shouldn't stop anyone from using this model in a lost lands pulp scenario. 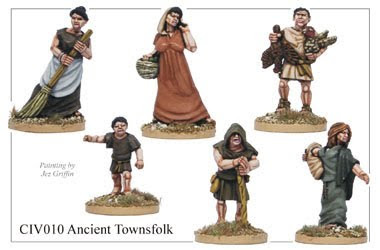 As a painter and diorama-maker first (and gamer second) I am very interested in townsfolk models. My favorite historic period is ancient Rome. 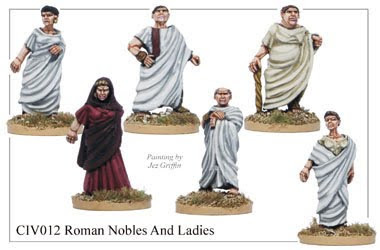 To make simple Roman and Celtic civilians I have been buying un-armored warriors and removing their weapons. Today I was happy to see the Foundry has a large new collection of ancient civilians. The sculpting is excellent, and there is a nice range of detailed poses: nobles, farmers, townsfolk, vendors, etc. I think these might be Mark Copplestone sculpts (or maybe not, does anyone know?). Foundry models are woefully overpriced at six models for $23/£11. Despite the cost, these figs are so nice I am tempted to order a couple sets. We have a new first for our magazine: the cover image of Ancient Warfare issue IV.1 now exists in 3D! Well-known sculptor Steve Saleh has modelled a 28mm miniature inspired by the cover illustration by Johnny Shumate. This co-production with Gorgon Studios can be had as an unpainted miniature from our website (with a photo of a painted example), or as a free gift! 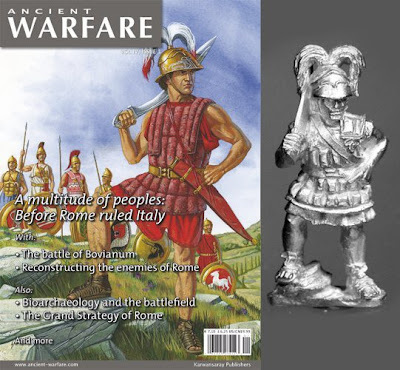 The 28mm Etruscan can also be purchased on its own from the Ancient Warfare website. Also see the Gorgon Miniatures website. I was unaware of WWII Britain's Home Guard until a few years ago. I gather most Brits are at least familiar with the BBC comedy, Dad's Army. Of course, as an American I had never heard of this TV show. My introduction to the subject was actually a wargame project on Matakishi's Tea House hobby blog. The Local Defense Volunteers (later named The Home Guard by Winston Churchill) was an organization with a compelling story. It was established to channel the patriotism of those British men too young or too old to join the military. They were charged with the protection of their own towns against the very real threat of a German invasion. What started as a rag-tag bunch, dressed in street clothes and drilling with broomsticks had by war's end become a capable fighting force. Thorough, yet concise, Neil Storey's The Home Guard published by Shire Books is a brilliant introduction to these defenders of Britain. Storey's 56 page book is a bit like an Osprey Publishing Men at Arms title. 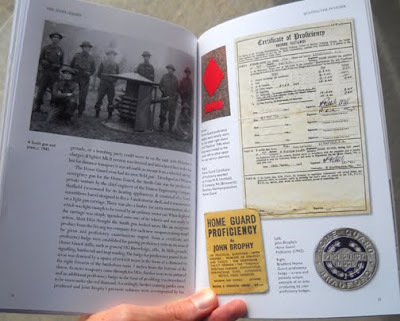 It's heavily illustrated (color and black & white photos, actually), it covers all the basic information one would want to know about the Home Guard as a military unit, and it arranges this info in a clear and visually appealing way. What I found most interesting was the resourcefulness required of the Home Guard troops during their early days. Early training relied on illustrated guidebooks, self-initiated courses, but eventually included specialized training schools run by the British military. So lacking in government support, the Local Defense Volunteer (LDV) "uniform" initially consisted of a simple armband worn over civilian clothes. In time the Home Guard troops received uniforms mirroring that in the regular Army. Organization was based at the county level. The author details on county abbreviations, cap badges, rank, and other insignia. As it grew the simple patrolling institution developed specializations such as antitank, antiaircraft, transport, and bomb squads. The first LDV troops were armed with whatever the men themselves could provide: hunting pieces, museum collections, even knives tied to a broom handles. As volunteer numbers swelled they gained government support, first receiving thousands of surplus American WWI rifles. Later their weapons included more standard Army pieces and artillery specially designed for the Home Guard. The Home Guard also includes info on woman volunteer units and Churchill's Secret Army, the Auxiliary Units. These were top-secret paramilitary men often plucked from the ranks of the Home Guard. Their job would go into affect after Britain's occupation by German forces. They were instructed to live as civilians, while organizing guerrilla attacks in areas controlled by the enemy. Britain's Home Guard had been lacking in serious scholarship until really the last 10 years or so. Storey's book is a great place to start a more detailed study. In addition to his own overview, the author suggests further reading. 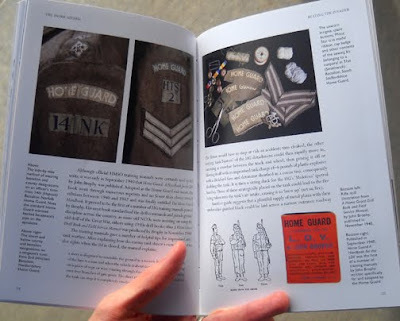 There are a few other Home Guard history books recently published, and many of the original 1940s training manuals are now available a reprints. It's impressive to think that elements of our hobby span back thousands of years. Toys soldiers, or “historic miniatures,” have existed since ancient times. Perhaps more interesting, the craft of sculpture-painting was a highly regarded profession in classical times. Ancient Greek and Roman statues are typically pictured as pristine white marble. Yet, historically these art objects were almost always painted in bright, even gaudy colors. Although smaller in scale, our own 54mm, 28mm, 20mm, and 15mm toys would easily be recognized as sculpture by any Greek or Roman. It pleases me to think that this ancient tradition of painted sculpture continues in the humble hobby of tabletop wargaming. Dazzlers: Ancients reborn in bright array in Harvard Magazine. True Colors in Smithsonian Magazine. Sculpture show of a different color in The Boston Globe. 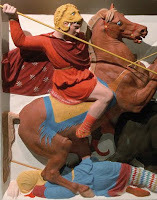 Gods in Color : Painted Sculpture of Classical Antiquity, by Vinzenz Brinkmann, et. al. 2007. The Color of Life, by Roberta Pazanelli and Vinzenz Brinkmann. For the study of painted classical sculpture see last year's exhibition at Harvard’s Sackler Museum: Gods in Color: Painted Sculpture of Classical Antiquity.